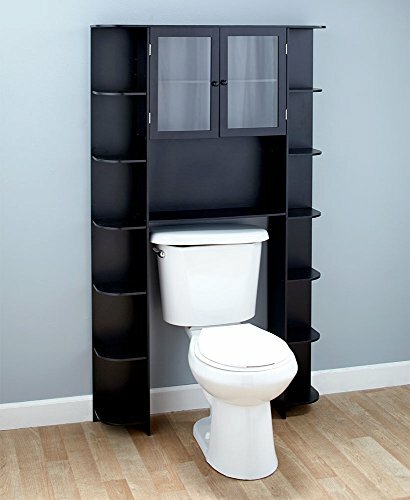 Make the most of the space in your bathroom with this Deluxe Over-the-Toilet Space Saver Cabinet. It has a sleek look, complete with double glass doors and multiple storage shelves. The top has 2 shelves behind the doors and an open shelf directly underneath, while each side has 6 shelves that go from top to bottom. Mounts to your wall to prevent tipping or shifting. 38-5/8"W x 8-1/4"D x 64-5/8"H. MDF. Assembly required; assembly hardware included.